Four Vines “Biker” Red Zinfandel 2012 | Wine Splash! Here is the perfect Red Zinfandel for all those who love the classic, bold California Zin style. Four Vines Winery are the rock stars of Zinfandel since Zinfandel is practically the only thing they produce! And Paso Robles is the best place to grow a great Zinfandel because it craves the hot, dry climate that this area is known for. Zinfandel normally has a high amount of sugar at harvest and can be fermented to create a dry, high alcohol wine. Those at Four Vines Winery may be thought of as Rebels but they are raising the bar to produce the best wines around since life is best enjoyed with a glass of great Zinfandel in your hand! In my glass, this Biker Zinfandel has a chassis that is deep ruby red in color with a purple rim. Invigorating aroma’s of ripe black cherry, blackberry, white pepper, and spice! Full bodied across the palate that is smooth but rich with tannins. My taste buds were doing some impressive wheelies! Racy flavors of fresh blackberry jam, black plum, wild bramble, pepper, and a hint of cedar. On the second sip, flavors of ripe black cherry, raisin, and smoky oak was more pronounced leading to a long, lingering finish. Intense and complex with wonderful layers of fruit and spice! This Biker Red Zin is truly “The Leader of the Pack”. Vrooom! Vrooom! Pair with grilled red meats, barbecued chicken, lamb, lasagna, tomato sauce based pizza, and smoked short ribs. 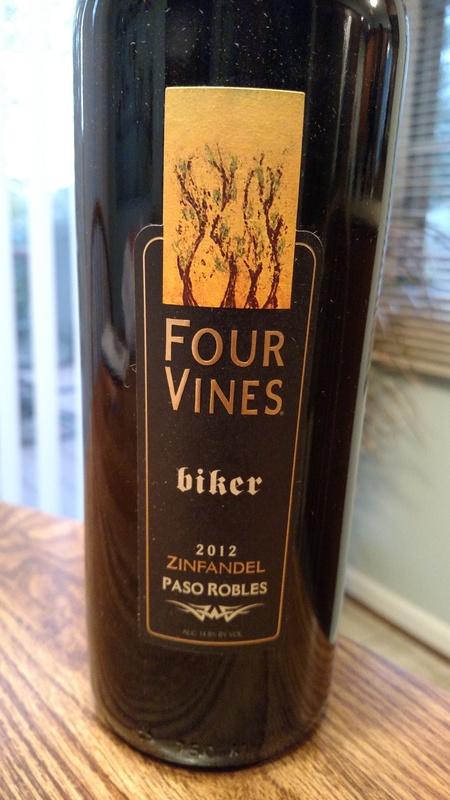 This Four Vines “Biker” Zinfandel is full throttle and brings one helluva ride! A Zinfandel that may not be for the faint of heart, but with promises to win your heart. A strong 93 Point Score! $24 a bottle average. WineSplashing! !